The Collector's Gem of the Week series has begun! Lasting throughout September, we'll be featuring a new rare tank each week that will only be available on the Premium Shop for a very limited period of time. This week, the KV-5 makes its appearance. Get the Collectors Gem of the Week package between 1st and 3rd September to receive the tank, a free garage slot and 3,000. Although the KV-5 can run up to 40km/h, it needs space to execute ramming techniques. Also, beware of vehicles from higher tiers as the KV-5 cannot penetrate armor beyond 125-209mm. Get the KV-5 if you strongly value a good defence and a tank's credit-earning capability. Bring out your KV-5 for a brawl and try to attain a mastery badge! Which one will you achieve: 3rd Class, 2nd, 1st or the coveted Ace Tanker? 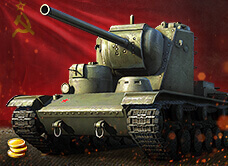 Acquire any Mastery Badge using the KV-5 during the event period. Submit the replay of the battle uploaded to WoTReplays.com or any other download page. For those using other download pages and those whose WoTReplays.com replay page look like this (missing Detailed Report tab), include a screenshot of the Personal Score tab of the Battle Results in your submission. Only battles from within the event period will be eligible for this event. Deadline of entry submission is on 3 September 2015 at 15:00 (UTC+8). Prizes will vary depending on the Mastery Badge acquired during the event. This thread will open for submissions on 1 September 2015 at 14:00 (UTC+8). Players may submit as many entries as they wish but may only win ONCE.